iOS 8 and OS X10.10 – breakthrough or a copy? It’s halfway through the Worldwide Developers Conference and Apple have already surprised the social media users with its announcements. Some feel quiet excited about updates, but others are rather disappointed with a lack of new devices’ launch. Nevertheless, the most anticipated and trending are new operating systems: for mobile devices – iOS 8 and for Mac computers – OS X10.10 Yosemite. Both were mentioned jointly in over 33k entries on social media platforms within two days. New operating system appealed to the huge audience, however WWDC 2014 failed in some areas. The most common reason of disappointment of social media users was the lack of new iPhone 6 and iWatch introduction. Others accused Apple of copying from other companies (Android, Blackberry). Sill positive opinions about Apple and WWDC exceed negative ones. Number of mentions on 3rd of June in relation to the previous day decreased by 20%. People generated much more contents before the start of the conference. 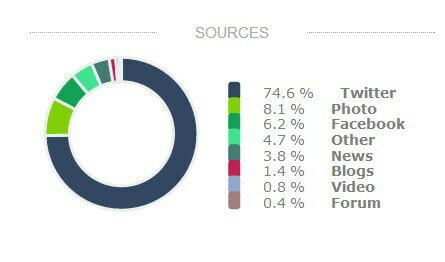 The most popular source of mentions was Twitter. Its users generated over 25k mentions related to WWDC 2014. As we mentioned before, social media users express rather positive attitude to WWDC and Apple. However, negative opinions are no exception. 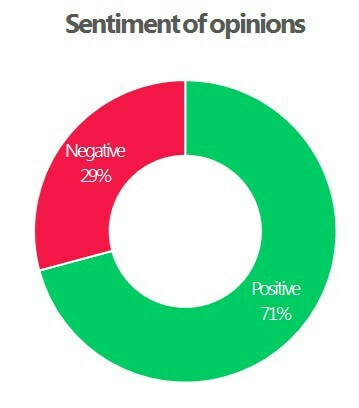 The chart below presents a proportion between positive (71%) and negative (29%) opinions. Negative opinions concern lack of new Apple devices and hardware implementation as well as copying ideas from others. New operating system is definitely the story number one on the conference. It was mentioned (within two days of WWDC) over 10 000 times, which constitutes over 30% of all entries related to WWDC. Second most trendng subject during event is HealthKit – a mobile application that can collect and analyze users health data. 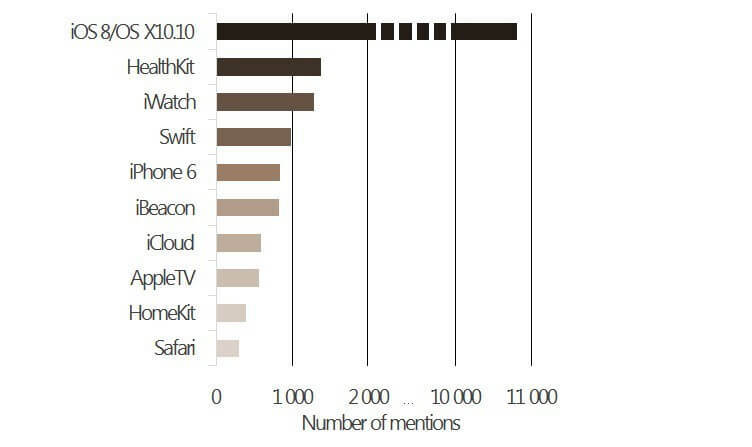 The graph below depicts the list of the most popular announcements with number of mentions. #Apple sure knows how to #wow a croud!! A call to #drdre during #wwdc. How nice! *Reads WWDC Keynote Summary* Swift sounds cool. But looks like I’m buying a pebble and an Amazon TV thing. When @Tim_Cook mentioned #Android during the #WWDC keynote, i realized that when you play catch up, you compare yourself with the best. General attitudes towards WWDC in social media are positive. Number of mentions as well as estimated social media reach dropped on the second day of the conference. iOS 8 and OS X10.10 are the most popular announcements from WWDC in social media. People are not satisfied that Apple haven’t released iPhone 6, iWatch nor any hardware. Other negative comments include accusations of copying solutions and technologies from other companies.